Inspired by Seasons, Spirits and Spells mingled with some evocative traditional tunes; a blend of moods and energies. 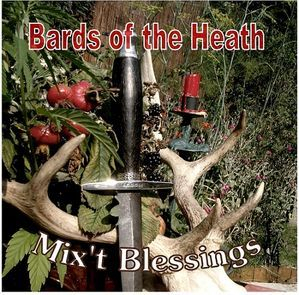 BARDS OF THE HEATH – was formed in 2004 as a musical unit in order to take on some gigs at unusual venues, such as events in the Ipswich Museum & found that many of John’s earlier Ballads from the 70’s fitted in with the Bardic theme of poetry & stories. John was a successful folk-singer in the 1970’s & later he took to running a local radio show with programmes such as ‘Folk-al-pint’ & ‘Goodluck on Saturday’. Jo Arcand has a long tradition of music in the family, relatives in Saskatchewan keep alive the ‘Métis’ style of Fiddle playing & dance; blending indigenous music of the native Cree & incoming French traders -see www.johnarcand.com . In 2011 ‘Magical Ballads’ was produced which included many Pagan Chants mingled with traditional songs, a mysterious mixture. In 2012 the group became a 5-piece unit with Pete Gosling—mandolin, guitar, mandola & fiddle; Janine Batchelor - bodhran & vocals; Graham Tilt -drum / djembe. Multi-talented, Pete brought a wealth of pretty tunes & a subtle touch to backing the ballads. Throughout this transitional phase gigs were coming in for a variety of venues including Leisure Centres in Felixstowe & Woodbridge & even Manningtree Methodist Church, where from the pulpit we sang adapted Shakespearean verses. From Johns solo repertoire we added a Robin Hood ballad & The Trees They Do Grow High,The Lovers Ghost, Twa Magicians & Maria Marten. Other Bardic types have given us their poems to set to music, we are currently playing Russet Lady, Calling & The Fairy Piper, by fellow songwriter Sheila Haskins. In the ‘70s playing Folk-clubs of Great Britain & European with his group ‘Trunkles’ John was aware that the success of any group can be judged by audience reaction along with re-bookings & quickly realised that with Bards of the Heath he had a sound which scored in both areas. In 2013 word had got around, with gigs coming in on a regular basis; as some of our live performances became videos on youtube - the product of Bill Johnston who joined the band on Melodeon, Mandolin & Concertina, - a versatile & experienced musician in his own right who has added much to bring a fuller sound, as has Des Hart on Bass, from the Jazz scene. The latest addition is Rob Lummis on percussion. Bards of the Heath are first choice for the Mind, Body, Spirit Festival organisers as our songs reflect Spiritual themes. We continue to be inspired, new songs continue to be composed :our first CD ‘Moonpathways’ was launched at the end of 2014, sales of which have exceeded our expectations as our own ‘fan-base’ increases & we now have a NEW CD ‘Mix’t Blessings’ 2017 Maybe one of our compositions will stand the test of time. DRUID LIFE Pagan reflections from a Druid Author – life, community, inspiration, health, hope and radical change. Imagine, if you will, a fantasy situation in which some scholar of mediaeval music discovers a whole collection of overtly Pagan songs from the period. If that notion appeals to you, keep reading. It occurred to me because it best sums up how I feel having listened to two albums from Bards of the Heath. Mix’t Blessing and Moonpathways are albums full of original, contemporarily written music, but most of the songs have a timeless quality. This is music with deep roots. This is music rooted in a deep understanding of the folk tradition – arrangements, instruments, tunes, all evoke folk even when they are wholly new. There’s a deep rooting also in the folklore of the land and in contemporary Pagan traditions. Listening to the lyrics, it’s also clear that these songs are written from a place of long relationship with the cycles of the seasons, the festivals and the wild world. All of this comes together in a sound that is fundamentally uplifting. The subject matter isn’t always light and cheery, but the music always holds hope, and a feeling of possibility. It’s very danceable (event organisers take note!). Really enjoyed your gig at the Sorrel Horse, and picked up the CD. We've been playing it non-stop in the car.